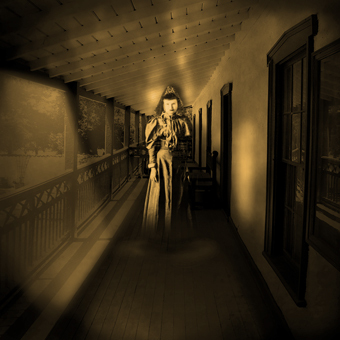 If San Diego’s Whaley House is too far out of the way, the next best place for ghosts-on-demand in Southern California may be Ventura’s Olivas Adobe. Local ghost-hunting legend Richard Senate has recently completed a documentary about the site, and the spirits apparently obliged, making a few fleeting appearances on camera and before witnesses. A midweek afternoon visit, when the place is relatively deserted, is perhaps the best time to look for the disturbed ghost of Senora Teodoro Olivas. Rancho San Miguel. By shrewd political maneuvering and hard work, Olivas became one of the wealthiest ranchers in Alta California. Fiestas held at the adobe lasted for days. All of this of course made him a target for bandits, who staged a vicious raid on his home in 1855. The robbers rounded up the family and servants and then searched the grounds for valuables. Here, the story gets fuzzy. One version maintains that a trusted Indian servant was secretly given Don Raimundo’s treasure box, reportedly containing anywhere from $3,000 to $75,000 in gold coins (depending on which story you choose to believe) to bury on the grounds while Raimundo stalled the outlaws. When the servant successfully completed his mission, he returned to the adobe and was shot before the desperados realized that he was the only person who knew where the stash was hidden. Visitors have seen Senora Olivas nervously pacing the high porch along the rear of the house. She is dressed in black and usually disappears in mid-stride. Volunteers at the Adobe often hear footsteps going up the creaky stairs or pacing on boards above, but see no one when the area is checked. Rocking chairs in the restored rooms tilt back and forth when no one is near, and objects move from their usual locations overnight when the place is deserted. Figures have appeared in the upper windows, looking sternly down on startled witnesses. One night in 2004, Senate managed to capture on a digital camera the image of a bearded male face peering in one of the upstairs windows. The window is 18 feet above the ground, with no balcony or ledge. A bit of research determined that the face resembles Nicolas Olivas, eldest son of Don Raimundo and his wife. Perhaps he was looking for one of his fingers, which was shot off in the robbery.